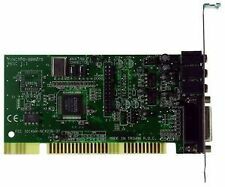 ADLIB Compatible Hi-Fi 8 bit ISA sound card for retro PCs by AAPRO LTD. 8 BIT ISA CARD. THIS CARD WILL WORK IN ANY COMPUTER EQUIPPED WITH AN ISA SLOT. 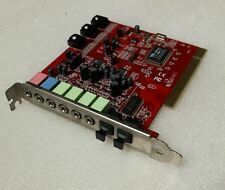 AAPRO AADLIB_V2b SOUND CARD. EACH CARD IS HAND BUILD IN THE UK FROM NEW AND RECYCLED COMPONENTS. PCI 2.2 I/F with bus mastering and burst modes. ACPI and PCI PMI support. New Multi-channel sound chip. 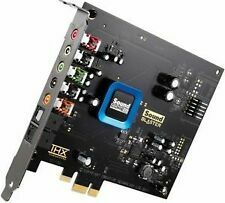 VIA ENVY24HT-S VT1721-0744CD 7.1 Sound Card. Compatible with SB16 (Sound Blaster). Solo scheda audio (nessun driver o software sono inclusi). Beim Verlust kommt KEINER auf! Lief bis dato, gebracht, (grob) gereinigt, länger Außer Betrieb. And, if audiophile quality listening is your thing, Sound Blaster Omni Surround 5.1 features a 600-ohm headphone amplifier for studio-grade monitoring. Featuring a built-in dual microphone array for crystal-clear voice communication and customizable SBX Pro Studio audio technologies, and a studio-grade 600 ohm headphone amplifier, the Sound Blaster Omni Surround 5.1 is ideal for anyone looking to seriously upgrade their PC or Mac audio experience. I used this sound card for a few years and the audio quality is incredible! I used both the optical audio out and the analog lines for 5.1 surround sound. The card looks amazing and performs equally as well. It comes with everything you see pictured but does not include the original CD. There are more current drivers on the Internet to download now. The Sound BlasterX AE-5 is a SABRE. The Sound BlasterX AE-5 is the first sound card to feature Xamp, our custom-designed discrete headphone amplifier. The ultra-low 1Ω output impedance drives 16-600Ω headphones perfectly. Creative X-fi Fatal1ty Fatality Edition. X-FI Fatality PCI card. X-FI Fatality Front Panel. 26 pin AD_Link connector for linking to the X-Fi I/O Console (upgrade option). 2 X mini MIDI female connectors for MIDI input and output. This card is a few years old now, but I always used my on-board audio instead of the audio from this card. It still works really well. 100% brand new and high quality.High-performance 6-channel Digital Audio Sound Card.Provides audio fidelity that rivals movie theaters with 6-channels digital sound.Customize Internet audio with the power and surround sound of EAX audio technology.Enjoy compelling 3D audio and 6-channel sound on multiple speaker series.Specifications3D effect: Microsoft Direct Sound 3D; Aureal A3D; HRTF 3D extension positional audio; EAX.Wave table synthesizer: DLS-base Wavetable music synthesizer.Software compatibility: compatible with Sound Blaster, Sound Blaster Pro and Direct Sound.Output sampling rate: (KHz) 48KHz.24-bit sample median.Linear standard output.Supports multi-speaker output to 6 speakers.Operating Systems: Windows 2000, XP, Vista, Windows 7, Linux.Package in. 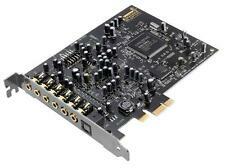 Sound Blaster 2.0 CT1350B Card. In good condition and is tested and working. Ran it on my 386 machine with no issues. Will be properly packed and shipped carefully. Creative Labs Sound Blaster AWE64 Gold User Manual. Creative Labs Sound Blaster 64 Gold Audio Tools on CD. Specializing in new and used electronics for over twenty five years! TESTED IN FULLY WORKING ORDER. This card works with certain Asus motherboard, occupying one PCI-E slot. It will not work with motherboards from any other vendor. Up for sale is a new AOPEN AW744L II PCI sound card - the serial number will be different than the one pictured. Yamaha YMF744B-R (updated and low power version of the YMF724 with 4-channel support). Used and working Auzentech Sound Card. No frills, just the card is included and an anti-static bag. 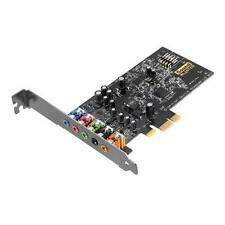 EVGA NU Audio Card, 712-P1-AN01-KR, Lifelike Audio, PCIe, RGB LED, Designed with Audio Note (UK). It will not work with motherboards from any other vendor. This card works with certain older generation Asus motherboard, occupying one PCI-E slot. EAX® Advanced™ HD 4.0. 8-channel High Definition Audio Codec. Yamaha Waveforce 192 XG (WF-192XG). Yamaha Waveforce XG PCI Wavetable Soundkarte (WF-192XG). Model: WF-192XG. Die Soundkarte wurde ausführlich geprüft und funktioniert einwandfrei. kein weiteres Zubehör. È compatta ma flessibile, con due preamplificatori microfonici Scarlett dal suono naturale con una latenza bass issima , I/O MIDI, quattro uscite analigiche e la stessa qualità del suono e conversione digitale ai vertici della categoria del resto della nuova gamma Scarlett. L'ultima generazione è migliorata su tutti i tre fronti. È compatta e versatile, con due preamplificatori microfonici Scarlett dal suono naturale con una latenza bassissima e la stessa qualit à del suono e conversione digitale ai vertici della categoria del resto della nuova gamma Scarlett. (Gebraucht, gereinigt, entstaubt, getestet, jeder Anschluss voll funktionsfähig, leichte Gebrauchsspuren möglich. 34, 47249 Duisburg) schicken. Altbatterien enthalten wertvolle Rohstoffe, die wieder verwertet werden. La scheda audio Xonar Phoebus della Asus migliora la chiarezza del suono durante il gioco. La scheda impedisce l'interferenza radio generato da altri componenti del computer. Amplificatore: 600 Ohm. FOCUSRITE SCARLETT SOLO 2ND GENERATION. 1 Preamplificatore microfonico Scarlett con sonorità naturali e abbondanza di gain. Oggetto nuovo e imballato munito di regolare scontrino o fattura fiscale. Windows 7 (64-bit), Windows 8.1, Windows 10. Embedded DSP handles the audio processing, freeing up the computer's CPU, minimizing latency and permitting an even greater system reliability. 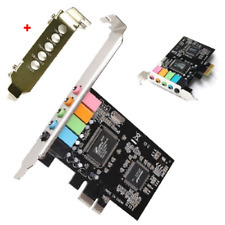 Digigram PCX924 v2 Professional Sound Card. PCX924 Technical Specifications. Booming bass is tightened; weak, thin bass is brought up; highs are always present and consistent in level. Dramatically improve audio consistency dynamically with that world-renowned Optimod sound. The drivers may be downloaded from the Orban FTP site. aureal vortex 2 Turtle Beach Montego II. Was working when pulled from a system. Condition is Used. Shipped with USPS First Class Package. Audio format choices include MP3, MPEG Layer 2 and linear PCM. AES/EBU and S/PDIF digital audio input and output (software selectable) with sample rate converters on all inputs. Four analog and digital play outputs. It will be one of the two pictured - I simply grab the next one off of the stack. In the box will be the card, driver CD or Floppy and paperwork (I will make sure DOS/Windows 3.X drivers are included regardless of the card you receive). Highscreen Sound Boostar 16 Wave 3D Soundkarte, ISA. You get the Highscreen Sound Boostar 16 sound card. Die SoundBoostar 16 basiert auf dem Analog Devices SoundPort AD1816 und unterstützt AdLib, SoundBlaster, SoundBlaster Pro & Windows Sound System. Mfr Part Number: XONAR AE. Frequency Response (-3dB, 24-bit/192kHz input): 10Hz to 65KHz. Exclusive EMI back plate provides noise shielding for exceptionally clear audio. Input Signal-to-Noise Ratio (A-Weighted): 103 dB. This card has been hand assembled in the USA and tested to ensure it is ready to go. This sound card is visiblu ready: get connected to the world of distributed IP audio. Note that no cables are included. These are used all around the world in on-air and production machines. That said, if you follow the install sequence given in the manual. Using Cirrus Logic’s CobraNet technology for streaming audio over Ethernet, the ASI6416 provides 8 stereo inputs and outputs. It can be connected to any CobraNet compliant device. The ASI6416 is based on the TMS320C6713 floating point DSP connected to a high speed bus-master PCI interface. Pulled working from my system when I built a new computer. Up to four AES16’s can be installed in a single computer. By coupling statistical analysis with low-noise clock generation techniques, SynchroLock is able to extract a very clean clock from AES signals affected by long cable lengths and other noise sources. 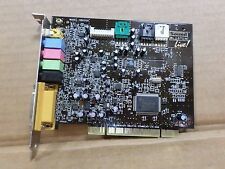 Up for Sale is a Creative Labs Sound Blaster Audigy 4 SB0290. Used in perfect working condition. Fast free shipping.